Over the past couple of years, comedian / actor Kevin Hart has become a staple in mainstream media, producing laughs with his loud, absurdity, and cartoon-style humor. While he’s recently taken the center stage of feature films, including the Ride Along movies, Get Hard, The Wedding Ringer, and Central Intelligence, Hart has always been a part of the stand-up comedy routine. Comedy specials feature like Kevin Hart: Let Me Explain, Kevin Hart: Laugh at My Pain, and Kevin Hart: Seriously Funny are just some of the highlights of his comedy angst, discussing the outlandish scenarios / gags in loud and breathless tone, which does work in his favor and has become his moniker staple. Now, with plenty of comedy films under his belt, Kevin Hart returns stand-up comedy role in the stand-up comedy film special Kevin Hart: What Now? Does Hart bring the laughs in this special or has the 37-year-old comedian lost his edge? Since the movie special is more of a stand-up comedy presentation than an actually feature film, there really isn’t much in the way of storytelling, which is why is decided to cut “THE STORY” part out of this review. Also, this is my first review attempt for a stand-up comedy special as What Now? got a wide theatrical release and I was able to see at my local movie theater. Interestingly, the film opens with a 15-minute skit, which parodies the classic James Bond aesthetic (with Hart playing a Bond-esque role). There’s a few cameo appearances in this skit, including Don Cheadle, Halle Berry, and Ed Helms, which add to Hart’s comedic performance. There a few small action scenes during this skit as the skit is (in truth) very well-done and quite humorous. As a side-note, the skit was directed by Tim Story, who has previously worked with Hart in the Ridge Along films, and does find the “groove” that jives with Hart’s timing. All in all, it’s a nice touch to open a stand-up comedy routine. Once the skit end’s the actually comedy special begins as Hart does what he does best in his stand-up comedy, bringing the laughs in eccentric / outlandish scenarios for the next 75 minutes. Given his popularity in current pop culture media, Hart takes to the stage in What Now? in a record-breaking fashion, performing in front of 50,000 spectator viewers at Philadelphia’s Lincoln Financial Field and marking it the first time a comedian has ever performed to an at-capacity football stadium. In continuing with the larger-than-life premise, What Now? has a larger production budget, utilizing several giant video screen to visual gags / representation and an expansive stage for Hart to perform on. 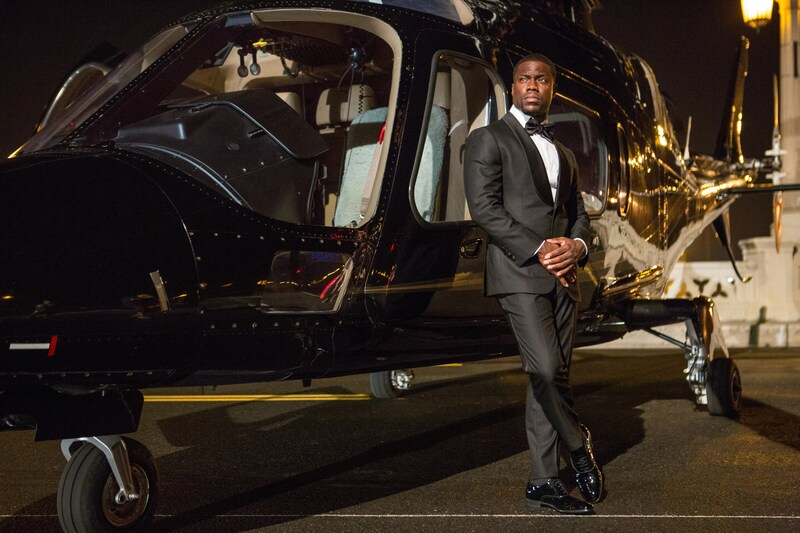 Thus, regardless, if you like him or not, Hart does know how to perform….in style. They say that comedy is subjective to viewers as many will have different taste in what they deem as “funny” or “hilarious”. Personally, I do like Kevin Hart and his style of humor, so I kind of knew what to expect. And that goes for everyone who is familiar with Hart’s style. Kevin does the usual shtick of discussing his family, his kids, his love, his physical stature, and several other wacky scenarios. As a whole, the comedy routine is funny, but nothing uproariously hilarious. Maybe that’s because of Kevin Hart’s popularity as he’s done many feature films / stand-up comedy performances over the past several years with same lingo and flavor of comedy. I’m not saying that What Now? is terrible, but it’s pretty much the same Hart with the same Hart style, with nothing new or innovate for the comedian to bring to the table. Basically, as the old saying goes “too much of a good is a bad thing”. There are some standout funny bits in What Now?. Anytime that Hart is talking about his kids is always funny. There’s one particular involving him watching the movie The Conjuring was probably my favorite one. However, there are some jokes that don’t quite land as super funny (i.e one involving a raccoon). In short, there’s really not much to say about the comedy in What Now?, for if you’re a fan of Kevin Hart than you enjoy it or hate it if you’re not. However, if you’re not fan of Hart, I would guestimate that you have little to none interest in seeing this comedy special. Kevin Hart returns to his routine of jokes, gags, and ridiculous scenarios in the stand-up comedy movie special Kevin Hart: What Now? It’s a fitting special presentation from one such as Kevin Hart, who has continued to mass his fame in current mainstream popularity. While the intro pre-show movie piece is fun and some of his humor is funny, it’s nothing ground-breaking from what viewers have seen from Hart’s past stand-up endeavors. Personally, it was good. I liked it, laughed along with it, but it wasn’t completely hysterically. Thus, I would say that What Now? Is an iffy choice or maybe just a rental for when it gets release (or appears on Netflix sometime next year). As it stands, Kevin Hart: What Now? is just strictly for Hart’s fans as it won’t win over any its naysayers, but neither will it go down as Hart’s best stand-up comedy performance. In my opinion, just take the special for face value and you’ll probably enjoy it. I’m glad to hear your thoughts on this. I think he’s a funny dude too but he probably has been too busy to write some really stand-out material and this sounds a little generic. I think I will wait for Netflix. Yeah, I kind of have to agree with you on that. Its the same material that everyone is accustomed. I would be only recommended to see it in theaters if you’re a “die hard” Kevin Hart fan (they’ll get the most out of it). For everyone else, best just wait for it to come out on Netflix.